After Labor Day, weather starts to cool, leaves start to change, and we welcome in a new season. Being your best you means adapting to the change in weather, season, produce, and energies. Pulling out your wool sweaters and sipping on a pumpkin spice latte is a great start to get you in the fall mood, but our acupuncturists have put together a handful of other tips to keep you at optimal health this fall season. Staying hydrated appears on just about every list of wellness tips. But it is crucial for your body to stay hydrated. In the summer, it’s hot your sweating a lot more, and being out the in sun is a constant reminder to drink water. But when the weather cools and the temperature isn’t as hot or humid, it is a lot easier to forget to drink water. Don’t get fooled by the cool weather. You need to maintain your summer water levels in the fall. Fall is the season of the lungs, but the lungs have a counterpart: the large intestines. Fall is a season of strengthening roots and ridding yourself of excess, and your large intestines are a key factor in helping rid your body of toxins and waste. Maintaining a healthy, happy gut is also key to keeping colds at bay. Reducing sugar foods will help your immune system function at its best, which will reduce your chances of catching a cold. A happy gut means feeding it seasonally fresh foods that contain the good kind of bacteria that strengthen your digestive system. Restorative yoga puts your body and mind into a “rest and digest” mode. This type of yoga allows you to slow down and destress and help you stay grounded. By centering your breath and body these poses allow you to maintain a physical and mental stillness. Restorative yoga is a great gateway to meditation and reflection and can help during the rush of the holiday season. Days get shorter in fall and we need to take advantage of the elongated sleeping cycle we are offered. Summer often leaves us exhausted, from travel and vacations, and physically, from having more hours in the day to physically get more things done. But fall, and the time change it comes with, is a reminder to slow down and take advantage of the extra hours of darkness. Let your body recuperate with at least eight hours of sleep. 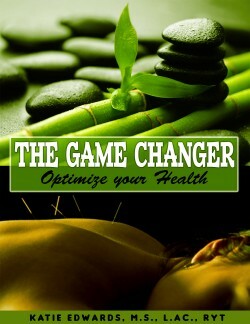 “Maintaining a seasonal acupuncture regimen is a great way to boost the body’s immune function before getting sick. This can be especially important when transitioning into the fall, which in Traditional Chinese Medicine is the season closely related to the lungs. The lungs are more susceptible to external pathogens this time of year so preparation is key to fighting off all the crud that goes around this time of year. Nutrition is also a key factor when caring for your body in order to stay healthy. Brothy soups are great this time of year to support the lungs. Avoid excess dairy as it may increase mucus secretions in the body. And Don’t forget to enjoy your favorite cup of hot tea while relaxing at night to help support the lung function as well. Happy Fall everyone!” Kirby Noone, M.S., L.Ac., Dipl. O.M.